What Do You Wear When Swimming? As a low-impact exercise, swimming is easier on the joints and bones compared to other workouts, like running or biking. Anyone can benefit from swimming for exercise, so it's often a top choice for those looking to lose weight, get in shape or maintain their current weight. If you're just beginning to swim for exercise, consider investing in swimwear and accessories to improve your workout. A swimsuit should top your list of swimming accessories. Though you can swim in a T-shirt and shorts, they're uncomfortable and difficult to swim in. Men can wear either a Speedo or well-fitted swim trunks. For exercise, women should wear a one-piece suit that streamlines the body and makes swimming more comfortable. Two piece swimsuits work well for some women, but make sure your breasts are well-contained by the top of the suit. Bikinis are not intended for physical activity. If you want to improve your time or create more resistance while swimming, consider wearing multiple suits at the same time. This adds more weight for your body to pull through the water, creating additional resistance to help build muscle. 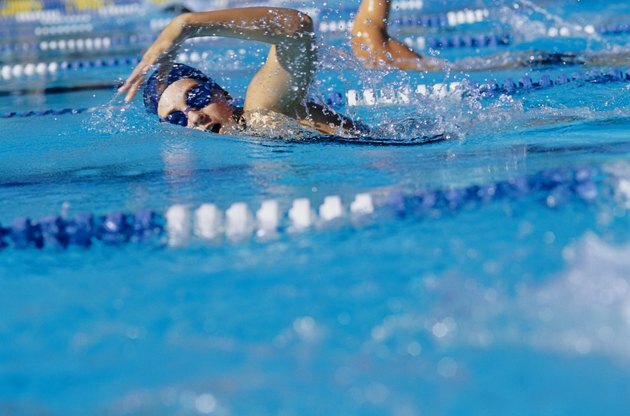 Wearing extra layers during practice can improve your swim time if you participate in swimming competitions. A nose plug is optional, but benefits those who can't plug their noses without the use of their hands. If you struggle to keep water out of your nose, an inexpensive nose plug will help you feel more comfortable while swimming, and can even improve your time. Goggles are optional, and allow swimmers to open their eyes underwater. Goggles come in handy if you're swimming laps in a pool and need to see the wall in advance. When you swim in a lake, pond or ocean, goggles keep dirt and debris out of your eyes and help you see more clearly underwater. A swim cap serves several purposes. A rubber swim cap prevents your hair from getting wet. This decreases the amount of time spent showering, cleaning up and primping after a workout. The cap also protects your hair from the chlorine used in pools. Too much chlorine can dry the hair and tint blond hair green. A swim cap also reduces resistance and keeps hair out of your eyes. What Is the Purpose of a Swimming Jockstrap?